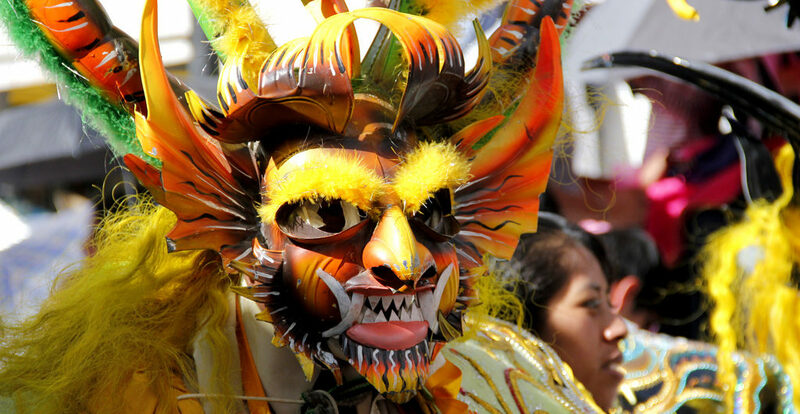 This exceptional and spectacular celebration takes place in the city of Puno -on the shores of Lake Titicaca – between the 1st and 14th of February of each year. It begins at 4:00 am of the first day with the “albas”, at which point fireworks, or the like, are thrust into the dawn sky. The central date is preceded by 9 days of preparation – the ”novenario” , and the celebration prolong itself for 8 days past the central date, period known as the “octava”. Of all dances organized by local dance crews, the diablada is the most characteristic and lavich. There are, as well, plenty of important differences in musical instruments. Countrymen play sicus (wind instruments similar to the zampoña, with 6 or 7 tubes), tarcas (flutes, each fabricated from one solid piece of elongated wood), picullos (crosswise flutes that measure 21 to 30 cm) and quenas (straight flutes of a variable number of orifices depending on regions of origin). City men, nevertheless, interpret their melodies with musical bands. The competition is so fierce, that famous instrumentalist from La Paz, Oruro and Cochabamba (Bolivia) are contracted.